The much anticipated Man City vs Arsenal fixture turned out to be a horrible one for one of the sides. Arsenal got hit 3-1 by a mentally-balanced Manchester City at the Etihad Stadium on Sunday - thanks to a hattrick from Sergio Aguero. 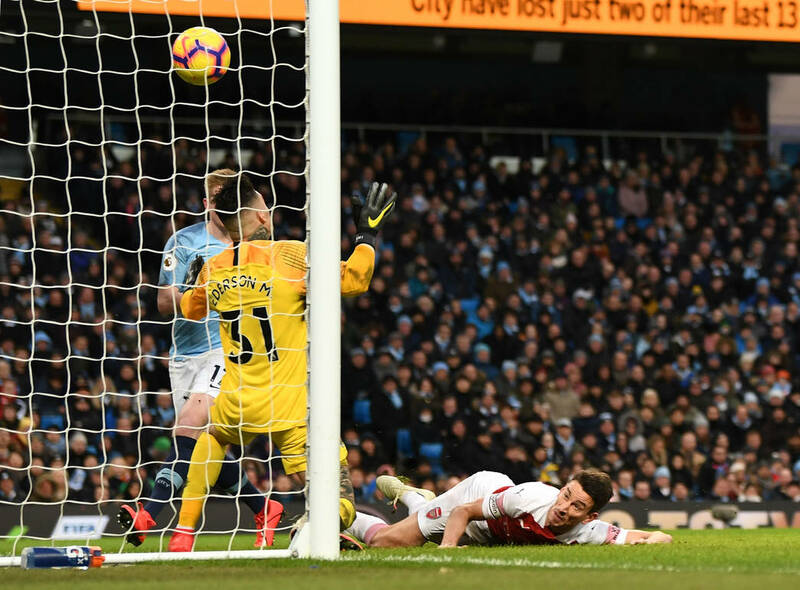 Starting with a three-man backline and an attack devoid of Mesut Ozil and Aaron Ramsey, the Gunners began trailibg just few seconds into the game through an Aguero header that left Leno stranded. The build-up to the goal was masterminded by our very own Alex Iwobi whose carelessness with the ball at the edge of his own box resulted to dispossession and then the opener. We saw no spark from the away side despite being behind but a comeback showed up even though it was an unexpected one. 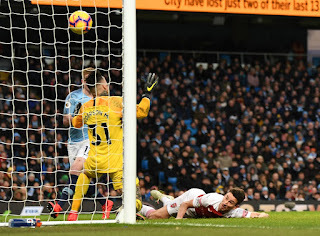 A cross from a Lucas Torreira corner kick aided a flick from Nacho Monreal and Koscielny was readily available to grab the equaliser. 1-1 and the spirit rose a bit in Unai Emery's army. The superb Matteo Guendouzi and Torreira were beginning to give a fierce fight to frustrate the home side but we got struck once again by the same man at the brink of halftime. Kun Aguero poked home from close range to ensure Arsenal go into the break as underdogs. It would be unfair not to mention that despite the result at the end of the encounter, Leno was top class. It would had been a more disheartening defeat if not for his saves. He denied Kevin De Bruyne but couldn't hold back Aguero from scooping his hattrick in the 61st minute.It was another close range shot from the Argentine - enough to seal the win for his side. Arsenal new signing Denis Suarez could not do anything to rescue his team as he made a debut appearance as a substitute against his former club. Arsenal threw away the opportunity to regain their fifth spot which Manchester United had snatched having won their game prior to the kick-off of the Man City vs Arsenal game. The battle for a top four finish has become even tougher with this development. It is a trip to Huddersfield for our next game which will be in the Premier League on Saturday. The last time we met, it was a 1-0 victory for us and Torreira was our saviour.